It was a common practice that after witnessing a death, all those present must bathe. However, Bhagavan said that in this case there was no need as there was no pollution. “She did not die. 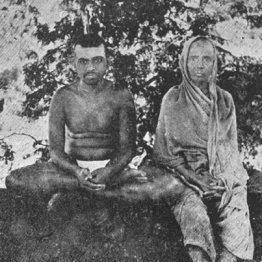 Instead, she is absorbed in Arunachala,” he stated. Later, the devotees who were there enquired, “Bhagavan, what did you do by keeping your hands on her head and her chest? What exactly took place?” Bhagavan explained, “Innate tendencies and subtle memories of past experiences that lead to future possibilities became very active when my hands were placed on her. Scene after scene rolled before her in her subtle consciousness. The outer senses had already gone. The soul was passing through a series of experiences, thus avoiding the need for rebirth and making possible the union of the mind with the Self or the Heart. The soul was at last disrobed of all subtleties before it reached its final destination, the supreme peace of liberation from which there is no return to ignorance.” From Ramana Periyapuranam. Note: To commemorate the anniversary of Ramana Maharshi’s mother’s death, a special puja known as her Aradhana or Mahapooja, is performed every year at the Matrbhuteshwara. Ramana’s final gift to his mother – the supreme peace of liberation from which there is no return to ignorance…read this wonderful post, especially if you are blown away by the perfect wisdom of the Sage of Arunachala…thanks Harsh Luthar. Reblogged this on When Guru comes Knowledge dawns.